Almost everyone has an embarrassing middle- or high school (or even college-age) crush story--the kind that makes you feel as if you can literally sense blood filling into your cheeks in the form of a blush--but few compare to the sheer terror of humiliation that comes with Lara Jean Covey's (Lana Condor) love letters getting sent to their addressees. There are five in all: Peter from middle school spin-the-bottle, John Ambrose from Model UN, Kenny from summer camp, Lucas from homecoming, and her sister's boyfriend Josh, the current and most forbidden object of covetousness. She keeps these letters in a hatbox in her closet, fondly reminiscing over them every so often, content enough in being invisible to the boys in her high school. 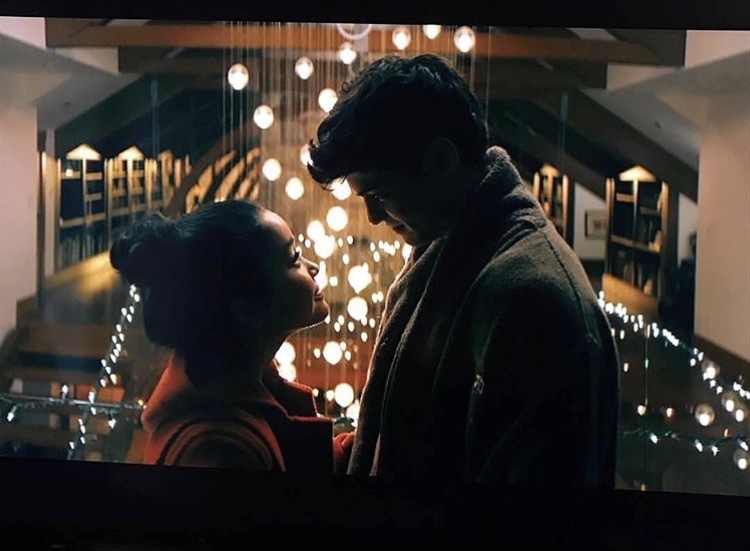 When her sister Margot (Janel Parrish) dumps Josh (Israel Broussard) before going off to college, Lara Jean is torn between acting on her feelings and remaining true to her sister. When those letters mysteriously get sent out to those crushes, Lara Jean barely has time to reel from the fallout before she's entering into a fake relationship with Peter (Noah Centineo) from spin-the-bottle. He wants to make his girlfriend Genevieve (Emilija Baranac) (conveniently Lara Jean's former friend turned nemesis) jealous; she wants to protect her relationship with her sister from any Josh-related bombshells. As fake-dating stories go, To All the Boys I've Loved Before, based on the YA novel by Jenny Han, is stuffed chock-full with the inevitable pining, miscommunications, and big damn confessions of love you'd expect from a teen love story. But it's the energetic, game cast and smart writing that makes To All the Boys I've Loved Before one of the best romantic comedies in years, and the strongest outing in the genre released by Netflix thus far. Lara Jean is a dyed-in-the-wool romantic addicted to Harlequin romances, but wholly practical about this whole fake dating Peter thing. When Lara Jean sits down with Peter to establish the rules for how their "relationship" will be portrayed and presented, it's a clever nod to how high-profile relationships are conducted in today's age of 24-hour news, tabloids, and social media--except it's explicit instead of implicit (I imagine). For the media-savvy of today, if it wasn't documented in a photo on Instagram or a pithy tweet, it might as well have not even happened at all, and when it comes to celebrities under intense media attention, the wrong gesture or candid look could mean that the entire relationship is on the rocks. Within the ecosystem of their high school, Lara Jean and Peter's relationship is the equivalent of a celebrity plucking a partner out of obscurity, and if they don't appear to be following the norms of how relationships are documented and observed, no one will actually believe they're together. If Peter and Lara Jean don't show any signs of physical affection--which Lara Jean charmingly bargains down from kissing to hand-in-the-back-pocket--no one will think their pretend relationship is real. Ditto if they aren't each other's cellphone wallpapers (both the home and lock screens, natch). Peter not taking Lara on the infamous ski trip (where scores of students are said to lose their virginity) would be the equivalent of stepping out--classic tabloid phrase--alone for a night on the town, prompting more questions and scrutiny. Lana Condor should be a star after To All the Boys I've Loved Before. 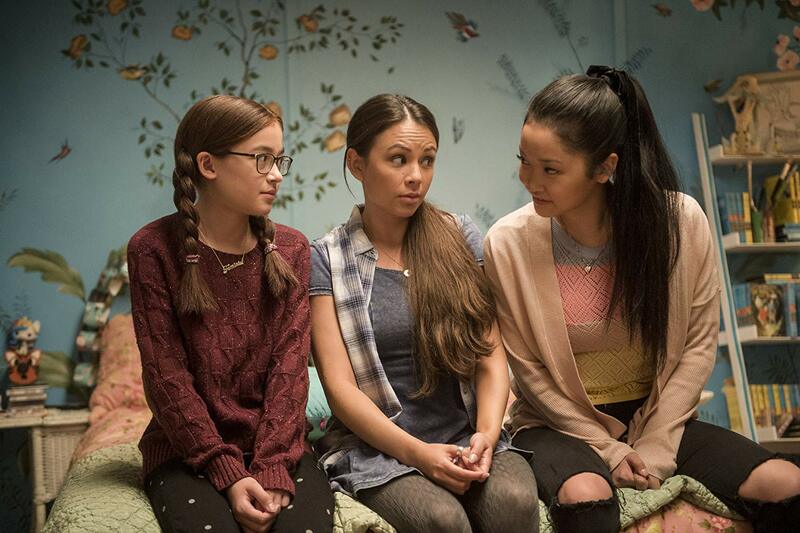 In the role of Lara Jean Covey, she's vivacious, quick-witted, deeply vulnerable, and impossible not to watch. The choice to include Lara Jean's thoughts as voice-over narration adds to, rather than detracts from, the enjoyably rollicking tale, and Condor handles the screwball highs and crushing lows of the genre with aplomb and grace. Noah Centineo, sounding remarkably like a blushing Mark Ruffalo in 13 Going on 30, is the ideal romantic foil for Condor, and had me rooting for him over Josh the moment he showed up and started calling Lara Jean by her last name. (Sorry, Josh.) It will surely be noted by many reviewers that John Corbett has perfectly aged into the slightly-awkward, entirely appealing widower-father role in a romantic comedy (while also satisfying the hot dad requirement that is best embodied by shows like Riverdale). In what may well be a nod to Larry Miller's Walter Stratford in 10 Things I Hate About You--both the 1999 movie and the 2009-2010 television series--Corbett's Dan Covey is a gynecologist, which is mined for humor here in ways both similar to and different from 10 Things. 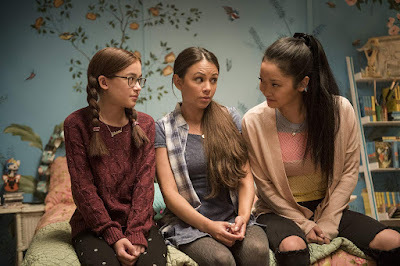 Anna Cathcart's Katherine Covey is the recognizable precocious youngest sibling who, as she notes to Lara Jean early in the movie, cancels her plans with her adoring new middle school friends to watch Golden Girls with Lara Jean on a Saturday night; the character doesn't truly end up being much more than that type, but Cathcart and Condor's interactions are believable and sweet. Janel Parrish, as oldest sister Margot, doesn't get much screen time, as many of the film's events are precipitated by her going off to college in Scotland; for the ostensible romantic rival, Israel Broussard's boy next door Josh doesn't really get much in the way of development or personality, either. Similarly, while Madeleine Arthur's Chris arrives like a hipster-cool bolt of lightning to defend Lara Jean's shoes from Genevieve early on in the movie, she doesn't ultimately do much or have much of an impact on the story. I imagine Margot, Josh, and Chris are more developed in the original novel. Lara Jean has shied away from real-life relationships, preferring to disappear into bodice-rippers and pine in silence over real boys, due to her own shyness and her overly-prescriptive ideas of what romance is supposed to look like, as well as her fear of being abandoned by people she loves (her mother has died before the events of the film). She'd rather dream up versions of Josh (and later Peter) to talk to in her own bedroom than actually do something about her feelings; she pours out her soul in neatly-written letters that she'll never send, but instead hoards, tenderly, like pressing on a bruise so that it continues to hurt. But in a media landscape where the heroines of romantic comedies and Harlequin novels alike are largely white, I have to wonder if there's a more subconscious feeling of rejection that plays into Lara Jean's discomfort with relationships, of Korean-American Lara Jean not seeing women like herself getting to fall in love in grand, dramatic ways. In the worlds of lusty Regency-era paperbacks and classic 1980s comedies like Sixteen Candles (which Lara Jean and Peter watch) the women who are desired and pursued are white. When your models for romance don't seem to include you or represent you, how might that influence your relationship to romance in general?